How to give permissions at the Account, Property and View level in Google Analytics? How to find and manage Account, Property and View Users in Google Analytics? How to change the permission of an existing user? How to remove an existing user from a GA account, property or view? How to find the list of GA accounts, properties and views, a user has got access to? This article is in conjunction with the article ‘Google Analytics Account Structure and Governance’ where I explained the Google Analytics account structure and how to set up properties and views in the event, when you own/manage multiple websites and/or mobile apps. Make sure to read this article, in order to get the best out of the present article. You as a GA user probably fall into one, more or all of the aforesaid categories. At the ‘account’ level, the ‘edit’ permission allow you to add/edit/delete a GA account and any/all of the properties, views, filters, goals, etc in that account. At the ‘property’ level the ‘edit’ permission allow you to add/edit/delete a GA property and any/all of the views, filters, goals, etc in that property. At the ‘view’ level the ‘edit’ permission allow you to add/edit/delete a GA view and any/all of the filters, goals, etc in that view. If you are assigned ‘Edit’ permission at the account level then you automatically inherit ‘Edit’ permission for all the GA properties and views in your account and this ‘Edit’ permission cannot be revoked for any individual property and/or view (unless you first revoke the ‘edit’ permission at the account level). If you are assigned ‘Edit’ permission at the property level then you automatically inherit ‘Edit’ permission for all the GA views in your property and this ‘Edit’ permission cannot be revoked for any individual view (unless you first revoke the ‘edit’ permission at the account or property level). 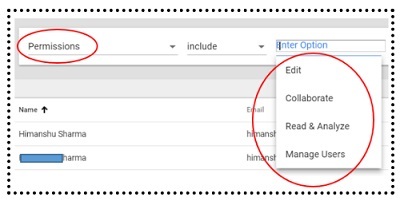 If you are assigned ‘Edit’ permission at an account level then you automatically inherit: ‘Collaborate’ and ‘Read & Analyze’ permissions for all the GA properties and views in your account and these permissions cannot be revoked for any individual property and/or view (unless you first revoke the ‘edit’ permission at the account level). If you are assigned ‘Edit’ permission at a property level then you automatically inherit: ‘Collaborate’ and ‘Read & Analyze’ permissions for all the views in your property and these permissions cannot be revoked for any individual view (unless you first revoke the ‘edit’ permission at the account or property level). If you are assigned ‘Edit’ permission at a view level then you automatically inherit: ‘Collaborate’ and ‘Read & Analyze’ permissions for your view and these permissions cannot be revoked for that view (unless you first revoke the ‘edit’ permission at the view level). ‘Edit’ permission is the most powerful permission that can be assigned to a user and can be considered equivalent to getting an ‘Admin’ privilege. At the ‘account’ level, the ‘Collaborate’ permission allow you to create, share and collaborate on personal assets for any/all of the properties & views in that account. At the ‘property’ level the ‘Collaborate’ permission allow you to create, share and collaborate on personal assets for any/all of the views in that property. At the ‘view’ level the ‘Collaborate’ permission allow you to create, share and collaborate on personal assets in that view. If you are assigned ‘Collaborate’ permission at the account level then you automatically inherit ‘Collaborate’ permission for all the GA properties and views in your account and this ‘Collaborate’ permission cannot be revoked for any individual property and/or view (unless you first revoke the ‘collaborate’ permission at the account level). If you are assigned ‘Collaborate’ permission at the property level then you automatically inherit ‘Collaborate’ permission for all the GA views in your property and this ‘Collaborate’ permission cannot be revoked for any individual view (unless you first revoke the ‘collaborate’ permission at the account or property level). 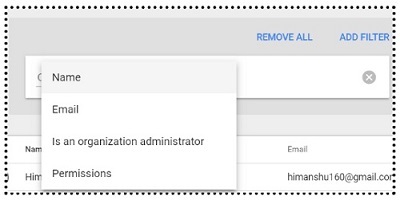 If you are assigned ‘Collaborate’ permission at an account level then you automatically inherit ‘Read & Analyze’ permissions for all the GA properties and views in your account and these permissions cannot be revoked for any individual property and/or view (unless you first revoke the ‘collaborate’ permission at the account level). If you are assigned ‘Collaborate’ permission at a property level then you automatically inherit ‘Read & Analyze’ permissions for all the views in your property and these permissions cannot be revoked for any individual view (unless you first revoke the ‘collaborate’ permission at the account or property level). If you are assigned ‘Collaborate’ permission at a view level then you automatically inherit ‘Read & Analyze’ permission for that view and this permission cannot be revoked for the view (unless you first revoke the ‘collaborate’ permission at the view level). See report and configuration data. Manipulate data within reports via: reporting filters, advanced segments, secondary dimension etc. Create and share personal assets. Manipulate data within reports via: reporting filters, custom segments, secondary dimension etc. If you are assigned ‘Read & Analyze’ permission at the account level then you automatically inherit ‘Read & Analyze’ permission for all the GA properties and views in your account and this ‘Read & Analyze’ permission cannot be revoked for any individual property and/or view (unless you first revoke the ‘Read & Analyze’ permission at the account level). If you are assigned ‘Read & Analyze’ permission at the property level then you automatically inherit ‘Read & Analyze’ permission for all the GA views in your property and this ‘Read & Analyze’ permission cannot be revoked for any individual view (unless you first revoke the ‘Read & Analyze’ permission at the account or property level). Note: You do not automatically inherit ‘edit’ and ‘collaborate’ permissions when you are assigned ‘read and analyze’ permission regardless of the level (account, property or view) at which you were assigned the permission. At the ‘account’ level, the ‘manage users’ permission allow you to add/delete GA users and assign them other permissions for any/all of the properties & views in that account. At the ‘property’ level the ‘manage users’ permission allow you to add/delete GA users and assign them other permissions for any/all of the views in that property. At the ‘view’ level the ‘manage users’ permission allow you to add/delete GA users and assign them other permissions for that view. 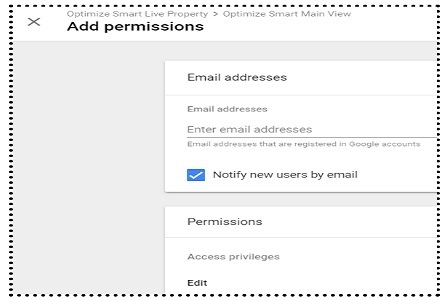 If you are assigned ‘manage users’ permission at the account level then you automatically inherit ‘manage users’ permission for all the GA properties and views in your account and this ‘manage users’ permission cannot be revoked for any individual property and/or view (unless you first revoke the ‘manage users’ permission at the account level). If you are assigned ‘manage users’ permission at the property level then you automatically inherit ‘manage users’ permission for all the GA views in your property and this ‘manage users’ permission cannot be revoked for any individual view (unless you first revoke the ‘manage users’ permission at the account or property level). Note: You do not automatically inherit ‘edit’, ‘collaborate’, ‘read & analyze’ permissions when you are assigned ‘manage users’ permission regardless of the level (account, property or view) at which you were assigned the permission. As you move down the hierarchy (Account > Property > View) you can give more permissions to a user, but not fewer. For example, if a user has Read & Analyze permission at an account level, he automatically inherit ‘Read and Analyze’ permission at all properties and views level. But you can also assign him ‘edit’ permission at a individual property or view level. On the other hand, if a user has ‘Edit permission’ at the account level, you can’t limit his permission to just ‘Read & Analyze’ at any of the property or ‘view’ level. Step-1: Login to your GA account and then navigate to your main view. Through such ‘user management’ links you can assign account, property or user level permissions to GA users. Step-1: First make sure you have got the manage users permission at the appropriate level (account, property or view).